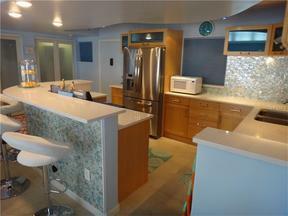 Absolutely gorgeous 6th floor Lido Key condo with fabulous views of the Gulf of Mexico from every room! Located at the Lido Ambassador this one bedroom, one bathroom condo has been updated from floor to ceiling and new furnishing throughout. The condo has a living room/kitchen combination. The kitchen has granite counter tops, stainless appliances and a breakfast bar. The living room has a large sectional couch to enjoy the views and a large flat screen television. Master bedroom has a king sized bed, views of the Gulf, large custom closet with built ins, flat screen television and en suite bathroom with a large shower and dual shower heads. Private screened in lanai with comfortable sitting area to watch the sunset. One assigned covered parking spot. Amenities include heated pool, shuffle board, exercise room and recreation room. Walking distance to St. Armands Circle. Six month minimum bookings. Pets not allowed due to association rules. Association requires a $100 non-refundable application fee and is mandatory.